For a truly relaxing time with family and friends, step inside this destination trailer that will make you feel right at home. The front private bedroom includes a wardrobe, and a dresser, plus there is a space for an optional washer and dryer for your convenience. Your family will appreciate the three slides in this unit, giving everyone room to stretch out. Sit around the large U-shaped dinette for a family dinner or just relax on the sofa with a cup of coffee. The kids will love the second bedroom in this trailer that includes a 58" sofa and a place to add a TV. For even more sleeping space, climb up into the loft and you'll find two bunk mats with a night stand and two cabinets for valuables! 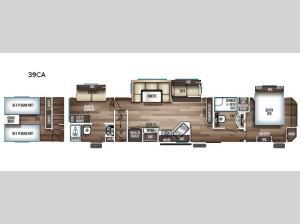 This trailer has everything you need for your next destination, including two full baths, a walk-in pantry, and a 18 cu.ft. refrigerator!